You never know what talents might be found within your own company. It's pretty clear that we have some of the world's greatest experts at Fall Creek on all things blueberries but did you know that we have a world record pumpkin carver? Scott Cully, our General Manager, is a reknowned giant pumpkin carver. In fact, he holds the Guinness Book Of World Records' world record for carving the world's largest pumpkins six out of the last twelve years! 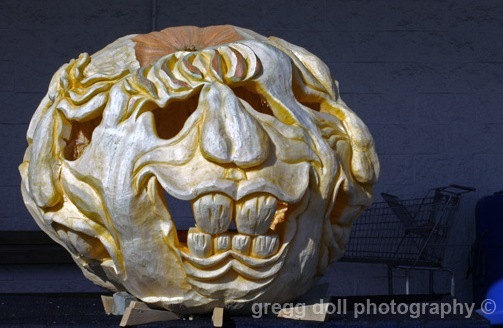 In 2010, he set another record carving a pumpkin that weighed in at a whopping 1,810.5 pounds. He carved this at the New York Botanical Garden in Bronx, New York. He's appeared on Johnny Carson, the Today Show, Nat Geo, NPR and others. He's also made celebrity carving appearances around the globe including Canada, Ireland and Germany. Scott was also invited to carve a giant pumpkin for Vice President Al and Tipper Gore in Washington, DC at the Vice Presential Mansion in 1999. Here is a recent video featuring an interview with Scott while he's carving a very large pumpkin. It's fun to watch to the pumpkin evolve and to hear Scott talk about his experiences and philosophy of pumpkin carving. All the appearances and notariety are great fun but Scott says his ultimate goal is simply to inspire children and their parents to spend quality time together creating their own memories carving pumpkins at home. We're really proud of Scott and will continue to share his pumpkin carving accomplishments in the future.